The Future Champions Golf Tour, with headquarters in San Diego, Ca now hosts over 150 annual events and is growing. Last year FCG hosted 4 events that each featured over 500 players. 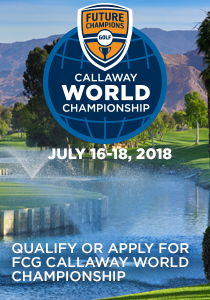 The draw is the first-class operations, friendly, staff, the opportunity to play with kids your age from around the world, and college coaches come out to watch and recruit heavily on the FCG Tour. “Last year we had 22 college coaches on site at this Championship which makes it a significant recruiting opportunity for junior golfers.” Says Smeal. The event is very competitive as last year we had several divisions have scores at double digits under par to win their division. These kids are exceptional junior golfers. This event is also unique in that all players are required to ride in a golf cart. We do a 7:30am shotgun start each day and the pace of play in 2017 was an average of 4 hours on each of the 6 championship courses. “We like to say this is one of the “COOLEST” events in junior golf even though it is played in one of the “HOTTEST” climates. We play early am before it gets too hot and the kids love the opportunity to ride in a cart at a big event. “ Says Smeal.